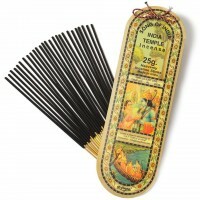 Song of India Temple Incense fills your home with the most beautiful fragrance you can imagine! Each stick is rolled by hand in India - Hand made from Sandalwood powder, aromatic roots, resins and herbs with natural flower oils. The mystic aroma smells like temples in India. Can also be placed in car, drawers, etc. just like potpourri. After about a month, burn and enjoy!